The 2-liter turbo charged engine combines with a race specification close-ratio 6-speed automatic transmission to transform the C4 into the strongest WRC rally car in the world today. With WRC manufacturers titles in 2003, 2004, 2005 and 2008, the bulging trophy cabinet also features consecutive driver's titles from 2004 to 2008. 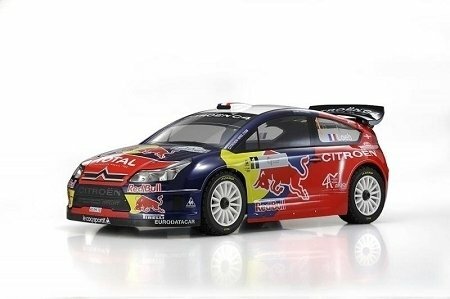 The driving force behind Citroen's recent dominance has been the C4 WRC. 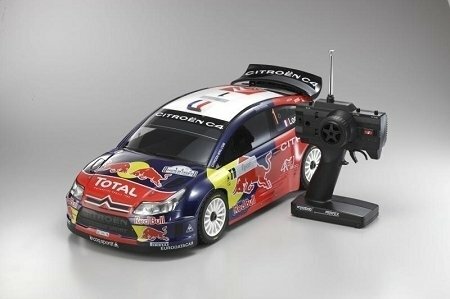 This model is a tribute the 2008 machine that delivered a crowning home victory for the French with the Citroen C4 in the 13th round Tour de Corse.In addition to dedicated R/C off-road courses, this machine attacks gravel, tarmac and any other surface with extreme confidence. The sweet resonating sound of the exhaust note signals the power of the GP engine that delivers the relentless drive of a true WRC machine. The precise dimensions of the long wheelbase chassis with 3-differential full-time 4WD produces the stable straight line performance and drift control that lets you transform any open space into a racing circuit for a driving experience like never before. 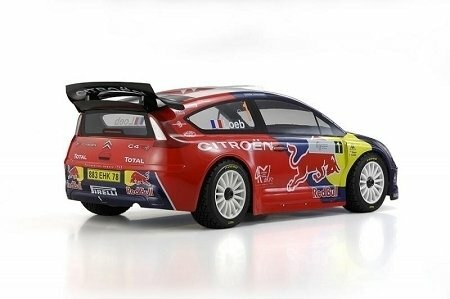 With roll and tire squeal like the real machine and the finely detailed body, the world of rally car racing has never been closer than with the dramatic action of this dynamic model racer.